Fits ESS cabinet and driver models: ESS 412T, AMT-1, ATM-1A, AMT-1B, AMT-1C AMT-1D, AMT1A, AMT1B, AMT1C, AMT1D, AMT Monitor, AMT-5, AMT5, AMT-6, AMT6, Concept Monitor, Connoisseur 10, Connoisseur 11, Evaluator, HD-12, HD12, HD-1200, HD1200, MONITOR, PS-1220, PS1220, PS-12C, PS12C, Tempest LS-1, Tempest LS1, 680-0050, 680-1055, 680-1057, 680-1064, 680-1123, 680-1124, 680-2058 ESS AMT, 681-1107, and many more! Please check the model and size of your speakers before ordering to be sure you receive the correct foam edge repair kit. Perfect for any average do-it-yourselfer. Our YouTube videos make installation easy! 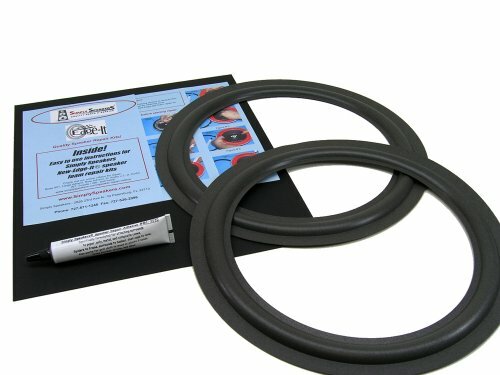 Join thousands of customers that have installed our New-Edge-It ® speaker foam repair kits successfully! We are proud to be a #1 seller on Amazon. We are a full service speaker repair center, in business for over 20 years!